In 2019, having consistent and accurate business information across the internet is critical for your business. With the ubiquity of internet service and devices, most people search for products and and services online. If you’ve never done this before, it may seem like an obvious and trivial thing – how hard could it be to manage and regularly update your online presence? If you’re not sure where to start, run a scan to check your online presence and see what the internet says about your business. Who needs to update their business information online? Inaccurate business information is bad for business. Every business needs to update their business information online. What business information needs to be updated? When business information is added to a website that is out of your control it becomes a ‘citation’ or business listing. Citations can be great for you because they help customers who search for your products and services online find you. How do you update your business information on all these different citation sites? You can add and update your business information to online directories manually. You will have to go to every site, create an account, username, password, remember all of those, request an update, and wait for your information to appear. Alternatively, you can use Connect4 Consulting’s Citation Submission Service and we can do this for you. You update your information once and our service will add this information to all of your relevant citation directories. If you’re losing potential customers because of inaccurate business information, contact us today. https://connect4consulting.com/wp-content/uploads/2019/04/photo-1551262364-b44032bca08d.jpg 626 801 Gabriel Seiden https://connect4consulting.com/wp-content/uploads/2013/04/Connect4Consulting_LO_FF_transparent1.png Gabriel Seiden2019-04-10 20:48:462019-04-10 20:58:49Inaccurate Business Information Is Not Good For Your Business! This post lists the top 50 citation sites for local SEO. A citation is an online reference to your business’s name, address and phone number (NAP). Google uses citations, and also links to your website, when evaluating the online authority of your business. Unlike links though, citations don’t need to be linked to your business’s website in order for you to be credited for them. To optimize for local SEO, most businesses should audit, correct, and create citations from high authority sites and sites that pertain to a particular business category. A law firm, for example, might require citations from AVVO whereas a restaurant needs to make sure its NAP information is accurate on YELP. According to Moz’s 2017 Local Search Ranking Factors survey, citations play a critical role in local search rankings. Consistency of structured citations—having the business name, address, and phone number (NAP) consistent across the company website, Google My Business, and trusted citation sites—is often one of the key ranking factors in Moz’s survey results each year. You can choose to update and verify the information on these top 50 citation sites for local SEO manually or you can hire someone to manage this for you. Consider Connect4 Consulting’s Local SEO Services. Updating your listings on these sites is not hard but it’s a tedious process. Each site has different information about you and a different way of verifying the information. Many sites require follow-up phone calls and emails to confirm your business listing. Unless this sounds like a good way to spend your time, Consider Connect4 Consulting’s Local SEO Services. Want to know how to show up in local search results? If you’re having trouble getting your business to show up in the Google local search results, you’re not alone. For starters, there’s a lot less territory there – with ads on the top and bottom of the page and online directories, there isn’t much room for small local businesses to show up on the first page of Google search results. Complicating matters, Google has a local filter that can cause a business listing to drop out of local search results. This filter isn’t very different from websites ranking organically in search results. Ideally, the best sites win the top spots. What causes a business to get filtered out of local search results? There are a variety of factors that influence local search results. The following situations might cause a business to get filtered out of the local search results. Google now takes into consideration where the mobile searcher is physically located when they are performing the search. This means that local search results can also now depend on where the business is physically located when the search is being done. When you set up your Google My Business category for your listing, choose the most specific category that is appropriate and relevant to your business. 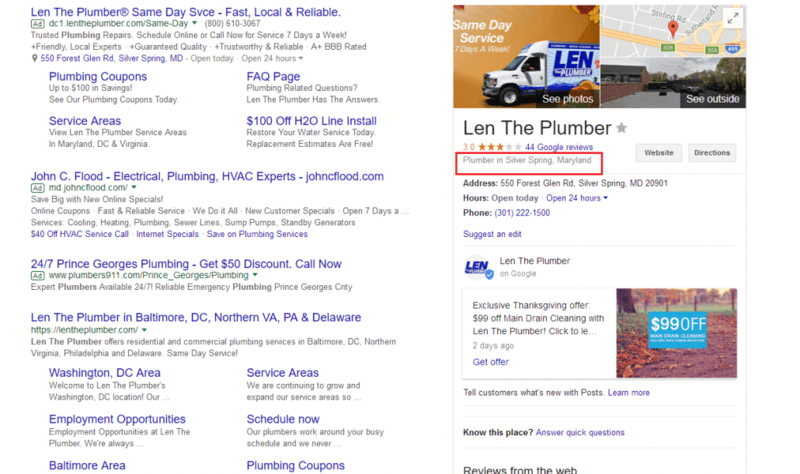 You can see in the screenshot below that Len The Plumber has chosen Plumber for it’s Google My Business Category. If you see your competitor outranking you, find out what category they are using and select the same category for your business. Look at all the other things they are doing to differentiate themselves online and copy what they are doing so you can outrank them. Make sure you don’t select too many categories. More is not better. Too many categories can confuse Google to the point where it’s not sure what your company’s specialty is. Try removing the less specific categories. If it’s possible, don’t have the same address as your competitors. This means that you should not list a virtual office or a UPS p.o. box store as your physical address. If you do this and there are competing businesses in the same location, there’s a good chance that you won’t appear in the local search results. If you’re an attorney, accountant, doctor, cpa, or some other professional in an industry where there might be an office filled with people working in the same category, Google may filter out some of your practitioners’ listings? Google doesn’t want one business dominating the first page of Google local search results. The workaround to this dilemma is that each practitioner’s Google My Business listing should have a different category (if possible) and should be directed to different URLS (either the person’s specific profile page or a page about their specialty – they should not all point to the business home page. Another thing you can do to differentiate the practitioners is to make sure that each practitioner has his or her own unique phone number in the Google My Business listing. Do they have a better Google+ description? Do they have more 5-star reviews? Is their Google My Business listing completely filled out while yours is missing some information? What is their business category? Is it different from the one you have selected? Remember that Google just wants to show the best businesses first. If you truly compete head to head with your competition, and you follow the advice in this blog post, you will eventually appear in the Google local search results.